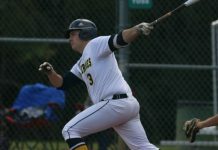 The UM-Dearborn men’s baseball team kicked off the second half of the season on February 25 at the RussMatt Invitational in Winter Haven, Florida. The men tried to improve on their 0-9 record from the first half of the season, which ended in October 2017. First up was a double header against the Point Park University Pioneers on Feb. 25. The Wolverines played hard both games, but came up short in both. They lost 14-1 in the first game and 18-1 in the second game. The lone run in the first game for the Wolverines came on a single from freshman Andrew Capone which led to a run from sophomore Cole VanWagoner in the fifth inning. The Wolverines had eight hits, a walk, and five strikeouts in the game. Freshman John Dyda pitched all six innings for the Wolverines. He gave up 13 hits, two home runs, four walks, and four strikeouts. The second game against the Pioneers saw the lone run for the Wolverines come off a Capone triple scoring freshman Jacob Leija. The Wolverines had six hits, two walks, and 11 strikeouts in the game. The Wolverines pitchers gave up 19 hits, seven walks, and three strikeouts. This gave the Wolverines a 0-11 record. The following day had the Wolverines playing in another doubleheader–the first against the Judson University Eagles who received votes for a national ranking. The Wolverines scored some runs in the game, falling short of their first win by a score of 7-3. Leija sacrificed to the pitcher in the second inning and allowed freshman Justin Dolney to score. In the fourth inning, Capone grounded out to the second baseman and allowed freshman Shaun Hannibal to score, making the score 3-2. During the seventh inning, the Wolverines scored another run when sophomore Antonio Carta hit a single, scoring freshman Paul Husak Jr. and made the score 7-3 in favor of the Eagles. The Wolverines combined for nine hits, three walks, and five strikeouts. Freshman Ramiro Rodriguez pitched 4.1 innings and only allowed four hits, five walks, and seven strikeouts. The second game of the doubleheader was once again against the Pioneers of Point Park University. The Wolverines scored one run in the fourth inning on a batted ball by Jacob Leija. They also scored four runs in the sixth inning by Leija, Capone, junior Daniel Kerr, and sophomore Ryan Beadle. The Wolverines lost to the Pioneers 7-5, dropping them to 0-13 for the season. On Feb. 28, the Wolverines got their first win of the season as they played a doubleheader against the Gannon University Knights. In the first game, the Wolverines won 10-3, but lost second game 10-2. This win gave the Wolverines a 1-14. In the first game the Wolverines got runs from Capone, Leija, Dolney, VanWagoner, freshman Enrique Tejada, Beadle, and Hannibal. The Wolverines had 14 hits, five walks, and four strikeouts. The Wolverines pitching was led by freshman Dan Bos, who gave up six hits, seven walks, and three strikeouts. 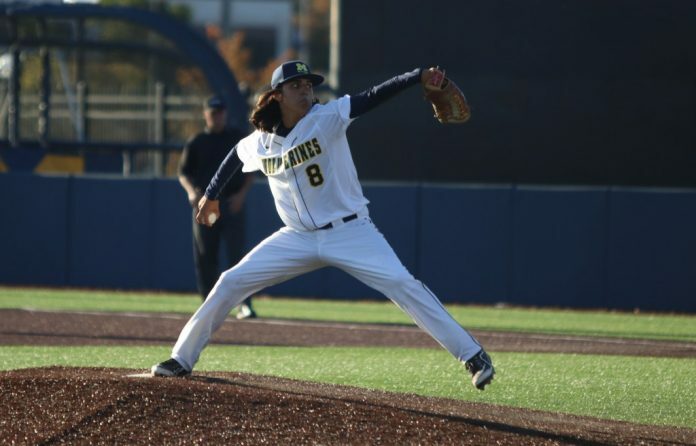 In the second game the Wolverines got runs from Rodriguez and junior Waymond Lemon Jr. As a team, the Wolverines had five hits, two walks, and seven strikeouts. The Wolverine pitchers gave up 15 hits, a homerun, and four walks. 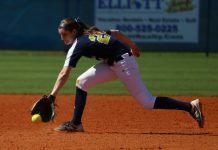 The final games of the RussMatt Invitational was on March 2 as the Wolverines took on the Warner University Royals in a doubleheader. The Wolverines got their second win of the season in the first game winning 12-6. 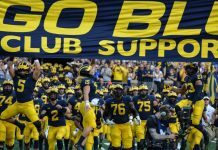 The Wolverines lost the second game 9-0, giving them a season record of 2-15. The first game against the Royals the Wolverines got runs from VanWagoner (3), Capone (2), Lemons (2), Kerr, Beadle, Hannibal, and Carta. The Wolverines as a team got 12 hits, six walks, and five strikeouts. Dyda pitched six innings in the game and allowed eight hits, two walks, and six strikeouts. In the final game of the Invitational, the Wolverines did not score a run but they did get five hits, three walks, and two strikeouts. Freshman Cameron Tubbs pitched four of the six innings. The pitchers allowed 10 hits, eight walks, and four strikeouts. 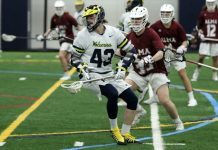 The Wolverines now wait until March 17 as they open up Wolverine Hoosier Athletic Conference (WHAC) as they travel to Grand Rapids to take on the Aquinas College Saints.